Jaipur : Indian Electrical and Electronics Manufacturers Association (IEEMA), flagged off Elecrama 2016 – World Electricity Forum here today. In the first of the series of Roadshows, IEEMA chose Jaipur to initiate a nationwide campaign as Rajasthan has demonstrated the will to proactively address the challenges in power sector such as mounting losses of state electricity boards, power losses and technology upgradation as an important step towards harnessing massive overall growth in the state. Rajasthan State Electricity Board accounts for a debt of Rs.81000 crore, one of the highest debt exposure among all states in the country. Rajasthan has already initiated reforms through tariff hikes, technical improvements and creating a separate company for power distribution. It is likely to be the first state to implement UDAY scheme of the Union government. Rajasthan has a power generation capacity of 16,235.50MW with 3,539.65MW capacity under construction and another 34,243 MW sanctioned for the 13th Plan (2017-22). The state with a per unit electricity purchase cost of Rs.4.5 has a peak deficit of 0.3% as compared to the national average of 2.3%. 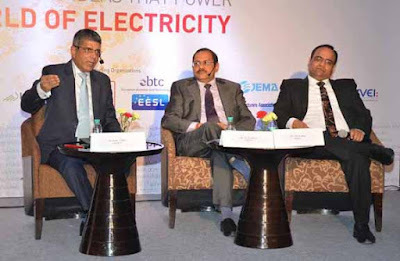 IEEMA plans to have nearly 20 roadshows across India to share the contents of ELECRAMA 2016 – World Electricity Forum among all direct and indirect stakeholders of the sector. Scheduled to be held at Bengaluru between 13 and 17 February 2016, the 12th edition of ELECRAMA will also be the World Electricity Forum. The five-day gathering will provide the industry a worldview on technology, best practices, new systems and forecasting the trends in the future of electricity, both from technology and a socio-economic point of view. 4 Union Ministers - Heavy Industries and Public Enterprises Minister Anant Geete, Minister of Power Piyush Goyal, Railways Minister Suresh Prabhu and Small and Medium Enterprises Minister Kalraj Mishra have confirmed their presence for ELECRAMA 2016.